Every pregnant mama asks this question and is usually surprised by the answer! Usually, your milk will ”come in” by day 5 postpartum. Milk volume increase rapidly from 38-96 hours postpartum and then levels off. 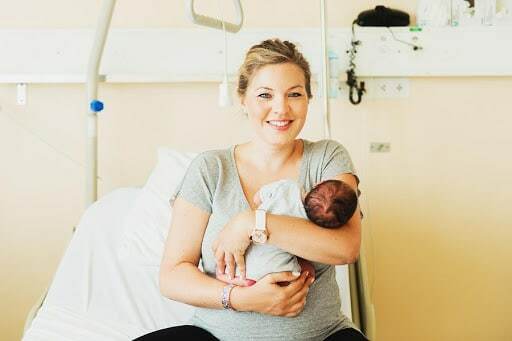 You will notice that around 24-48 hours after delivery, your baby will wake and cue to feed more often (about every ½ hour to 3 hours) or may have 1 to 2 long periods of cluster feeding. They will want to nurse on and off for hours which will help bring your milk in. You will then notice a day or two later you milk will come in. After birth your breasts will become larger, heavier and possibly tender as they start producing milk. This normal fullness occurs because the swelling of the breast tissue and increase milk supply. The swelling will gradually go away, and your breasts will feel softer and they will continue to produce milk. I think it is important note that Lactogenesis (milk production) will come in regardless of whether the baby is nursing, as milk production is hormonally driven. If you have chosen not to breastfeed or you have had an infant loss your body will still start to produce milk. Until you milk comes in around day 5 your baby will be receiving colostrum when they nurse. Around your 20th week of pregnancy your body starts to produce the “Liquid gold” called colostrum. Colostrum is the yellow first milk that is full of immunogloulins that provides the framework for your baby’s immune system. Colostrum is low in volume but high in calories. Amazingly you can even practice antenatal hand expression when you are pregnant around 36 weeks gestation and store your colostrum before baby arrives (always check with your care provider prior to starting to make sure it is safe for your pregnancy). What can you do to help your milk come in? 7) Be kind to yourself! Wakens to be fed at least 8 times in 24 hours. Breastfeeding is different for every mama and it takes time to become established. If breast feeding is tougher than you expected try not to get discouraged. Feeding a newborn every few hours can be exhausting and it is OK to have a slow start. It is always helpful to reach out and get some guidance early. If you or a mama you know needs some lactation help, any Mama Coach in your area will be able to come to you and assess your needs.